Lipodystrophy syndromes represent a group of rare, heterogeneous disorders characterized by progressive loss of fat tissue, mainly from the subcutaneous compartment and occasionally from visceral fat. Subcutaneous loss of fat can occur as generalized or partial lipodystrophy; the latter is more common. Progressive lipodystrophy is the most common type of partial lipodystrophy. The etiology of this condition is obscure. Lipodystrophy is often associated with glomerulonephritis, low C3 serum complement levels, and the presence of a C3 nephritic factor. C3 nephritic factor is a serum immunoglobulin G that interacts with the C3bBb alternative pathway convertase to activate C3. 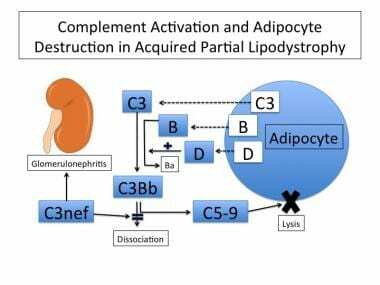 C3 nephritic factor induces the lysis of adipocytes that secrete adipsin, a product identical to complement factor D. The distribution of the lipoatrophy is postulated to be dictated by the variable amounts of adipsin secreted by the adipocytes at different locations. Model of the adipocyte destruction in acquired partial lipodystrophy showing complement activation at the adipocyte surface resulting in adipocyte lysis. Adipocytes synthesize C3, factor B, and factor D (adipsin), which allows C3bBb to be formed locally, but which usually does not result in the activation of the terminal lytic part of the complement pathway (C5-9).The IgG antibody, C3Nef, prevents the alternative complement C3-convertase C3Bb from dissociative inactivation, resulting in adipocyte lysis. Adipocytes synthesize factor D, the limiting component of the alternative complement pathway, which cleaves C3-bound factor B to its active enzymatic form. Factor D is expressed to a higher extent in the fat cells of the upper half of the body compared with the lower half, and it is possibly this regional difference that accounts for the restriction of fat loss to the head, arms, and trunk. C3Nef is also associated with type II, dense-deposit membranoproliferative glomerulonephritis in which subendothelial deposits of immunoglobulin and C3 are probably due to a deregulated alternative complement pathway. No racial predilection is reported for progressive lipodystrophy. Progressive lipodystrophy is 4-5 times more common in women than in men. Of patients with progressive lipodystrophy, 80% are females. The accumulation of fat in the buttocks and lower limbs occurs almost exclusively in females. Males who are affected usually have lipoatrophy without lower body hypertrophy. Progressive lipodystrophy typically starts in individuals aged 0-20 years, with most cases starting before individuals are aged 15 years. Progressive lipodystrophy tends to develop earlier in most male patients compared with female patients. The prognosis for progressive lipodystrophy is correlated with the renal complications and the onset of renal failure. Acquired progressive lipodystrophy is a nonfatal condition, but it is frequently associated with mesangiocapillary glomerulonephritis, which can lead to renal insufficiency. In pregnancy, more severe renal disease is associated with a risk of intrauterine growth retardation, prematurity, and fetal death. Associated autoimmune disorders are also present in some patients, including systemic lupus erythematosus and dermatomyositis. Herranz P, de Lucas R, Perez-España L, Mayor M. Lipodystrophy syndromes. Dermatol Clin. 2008 Oct. 26(4):569-78, ix. [Medline]. Kanazawa N. Nakajo-Nishimura Syndrome: An Autoinflammatory Disorder Showing Pernio-Like Rashes and Progressive Partial Lipodystrophy. Allergol Int. 2012 Mar 25. 0(0):[Medline]. Okazaki M, Tanaka K, Kodaira S, Homma T, Miyashita H. One-Stage Transfer of 2 Paddles of Thoracodorsal Artery Perforator Flap With 1 Pair of Vascular Anastomoses for Barraquer-Simons Syndrome. J Craniofac Surg. 2012 May 4. [Medline]. Mitchell SW. Singular case of absence of adipose matter in the upper half of the body. Am J Med Sci. 1885. 90:105-106. Maffeis L, Vercellesi P, Corona F, Forzenigo L, Gelmetti C. Acquired acral lipodystrophy in a 6-year-old girl. Pediatr Dermatol. 2009 Sep-Oct. 26(5):566-8. [Medline]. de Haan W. Lipodystrophy and muscular dystrophy caused by PTRF mutations. Clin Genet. 2010 May. 77(5):436-7. [Medline]. Nabrdalik K, Strózik A, Minkina-Pedras M, Jarosz-Chobot P, Mlynarski W, Grzeszczak W, et al. [Dunnigan-type familial partial lipodystrophy associated with the heterozygous R482W mutation in LMNA gene - case study of three women from one family]. Endokrynol Pol. 2013. 64(4):306-11. [Medline]. Krawiec P, Mełges B, Pac-Kożuchowska E, Mroczkowska-Juchkiewicz A, Czerska K. Fitting the pieces of the puzzle together: a case report of the Dunnigan-type of familial partial lipodystrophy in the adolescent girl. BMC Pediatr. 2016 Mar 14. 16:38. [Medline]. Liu L, Jiang Q, Wang X, Zhang Y, Lin RC, Lam SM, et al. Adipose-specific knockout of SEIPIN/BSCL2 results in progressive lipodystrophy. Diabetes. 2014 Jul. 63(7):2320-31. [Medline]. Honda-Ozaki F, Terashima M, Niwa A, Saiki N, Kawasaki Y, Ito H, et al. Pluripotent Stem Cell Model of Nakajo-Nishimura Syndrome Untangles Proinflammatory Pathways Mediated by Oxidative Stress. Stem Cell Reports. 2018 Jun 5. 10 (6):1835-1850. [Medline]. Kurugol Z, Ulger Z, Berk O, Tugral O. Acquired partial lipodystrophy associated with varicella. Turk J Pediatr. 2009 Nov-Dec. 51(6):617-20. [Medline]. Ferrarini A, Milani D, Bottigelli M, Cagnoli G, Selicorni A. Two new cases of Barraquer-Simons syndrome. Am J Med Genet A. 2004 May 1. 126A(4):427-9. [Medline]. Haxton MJ. Progressive partial lipodystrophy in association with intrauterine death and growth retardation. Am J Obstet Gynecol. 1983 Dec 1. 147(7):837-8. [Medline]. Fukumoto D, Kubo Y, Saito M, Arase S. Centrifugal lipodystrophy of the scalp presenting with an arch-form alopecia: a 10-year follow-up observation. J Dermatol. 2009 Sep. 36(9):499-503. [Medline]. Yurekli B, Ozdemir Kutbay N, Altay C, Unlu SM, Sen S, Onay H, et al. A new type of familial partial lipodystrophy: distinctive fat distribution and proteinuria. Endocr Res. 2018 May 7. 1-6. [Medline]. Payapvipapong K, Niumpradit N, Nakakes A, Buranawuti K. A rare case of acquired partial lipodystrophy (Barraquer-Simons syndrome) with localized scleroderma. Int J Dermatol. 2014 Jan. 53(1):82-4. [Medline]. Quecedo E, Febrer I, Serrano G, Martinez-Aparicio A, Aliaga A. Partial lipodystrophy associated with juvenile dermatomyositis: report of two cases. Pediatr Dermatol. 1996 Nov-Dec. 13(6):477-82. [Medline]. Lightbourne M, Brown RJ. Genetics of Lipodystrophy. Endocrinol Metab Clin North Am. 2017 Jun. 46 (2):539-554. [Medline]. Spranger S, Spranger M, Tasman AJ, Reith W, Voigtlander T, Voigtlander V. Barraquer-Simons syndrome (with sensorineural deafness): a contribution to the differential diagnosis of lipodystrophy syndromes. Am J Med Genet. 1997 Sep 5. 71(4):397-400. [Medline]. Hagari Y, Sasaoka R, Nishiura S, Ishihara M, Mihara M, Shimao S. Centrifugal lipodystrophy of the face mimicking progressive lipodystrophy. Br J Dermatol. 1992 Oct. 127(4):407-10. [Medline]. Sorkina E, Frolova E, Rusinova D, Polyakova S, Roslavtseva E, Vasilyev E, et al. Progressive Generalized Lipodystrophy as a Manifestation of Autoimmune Polyglandular Syndrome Type 1. J Clin Endocrinol Metab. 2016 Apr. 101 (4):1344-7. [Medline]. Kumar NS, Shashibhushan J, Malappa, Venugopal K, Vishwanatha H, Menon M. Lipodystrophy in Human Immunodeficiency Virus (HIV) Patients on Highly Active Antiretroviral Therapy (HAART). J Clin Diagn Res. 2015 Jul. 9 (7):OC05-8. [Medline]. Coessens BC, Van Geertruyden JP. Simultaneous bilateral facial reconstruction of a Barraquer-Simons lipodystrophy with free TRAM flaps. Plast Reconstr Surg. 1995 Apr. 95(5):911-5. [Medline]. Serra JM, Ballesteros A, Mesa F, Bazan A, Paloma V, Sanz J. Use of the temporal muscle flap in Barraquer-Simon's progressive lipodystrophy. Ann Plast Surg. 1993 Feb. 30(2):180-2. [Medline]. Font J, Herrero C, Bosch X, Cervera R, Ingelmo M, Mascaro JM. Systemic lupus erythematosus in a patient with partial lipodystrophy. J Am Acad Dermatol. 1990 Feb. 22(2 Pt 2):337-40. [Medline]. Chong AY, Lupsa BC, Cochran EK, Gorden P. Efficacy of leptin therapy in the different forms of human lipodystrophy. Diabetologia. 2009 Sep 2. [Medline]. Why the Reluctance to Use Biosimilar Insulins for Diabetes?